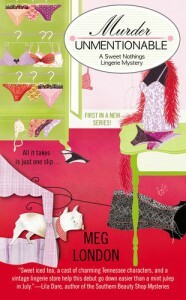 Murder Unmentionable - Meg London - review - What is Kimberly reading now? This clearly was an episode of Scooby Doo in a lingerie shop. I read another review where the reviewer said it was nice to have characters that were so optimistic about as opposed to just thinking the world was going to end because something bad happened near them. Once I read that, my point of view changed about the book. I stopped thinking it was silly and a confusing waste of a read, and found the book to cute and fun. Now I want to go lingerie shopping.